Commerce is intrinsically a social activity and Social Commerce, by definition, is about buying online in an interactive, participatory manner. The plethora of options available a click away has increased the need to involve friends and family in the purchase process. Given this behavior, e-commerce companies are launching social tools to drive engagement (and consequently transactions), and social networks are experimenting with “Buy” buttons to monetize user engagement. Additionally, several new companies are being created that are trying to build networks and transactions at the same time, although currently, they seem to be restricted to specific verticals. The first wave of ecommerce companies in the 90s (Alibaba, Amazon, Rakuten) used intent and search driven techniques including catalogs, prices and reviews for information dissemination. A decade later, a second wave arose (Wechat, Facebook etc) that created engaging communities around our real-world interests, connections, and relationships which further facilitated the discovery of products & services. Fast forward today, businesses are trying to be more social and more commerce driven. India has over 140 million MAUs and 69 million DAUs on Facebook, and notably, over 90% of them are on mobile. WhatsApp is the most widely used messaging platform in the country, having about 200 million MAUs and an impressive 77% of the users coming back to the application daily. I strongly believe that this user base presents a vast scope for creation of valuable social commerce enterprises that can thrive on a deep understanding of the Indian user and India-specific supply chains. Unlike categories such as electronics and mobile, fashion & home decor has a larger number of SKUs, a greater need to touch and feel the product, multiple variants with respect to the size, color, etc. and a large number of suppliers and brands. Lost in the lattice of options, consumers prefer to seek assistance from friends, family, influencers, and celebrities to arrive at a purchase decision. Building a social curation and recommendation layer could lower customer acquisition cost and ensure higher user retention in this category. There is a large opportunity to build a fashion and home decor commerce platform that leverages social tools, communities, lookbooks, influencers, to facilitate faster buying decisions. The experience of Chinese companies is instructive on this front. In addition to Taobao, which is innovating with its social selling features like live streaming, influencer marketing, special interest groups, news feed etc., almost all companies ( JDLive, Pinduoduo, TMall Live etc. ) are experimenting on the social commerce piece. Back home, Myntra gives a fashion magazine appeal to e-commerce; Limeroad has lookbooks, ‘trending’ & ‘celebrity spotting’ sections; Roposo & Wooplr are using influencer networks to power e-commerce. Despite these attempts, I believe the offline buying behavior (a mix of curation, social recommendation, trials, and assistance) is yet to be replicated online. There is a large opportunity to build a fashion and home decor commerce platform that leverages social tools, communities, lookbooks, influencers, etc. to facilitate faster buying decisions and create a valuable e-commerce destination in the process. Fun fact: Taobao witnesses 25 minutes of time spent per day per user vs 9 minutes per day per user on Amazon, primarily because of its social features which drive engagement. India is a home to more than 50mn SMBs and many of these sellers are using social platforms like Facebook pages, WhatsApp broadcasts, Instagram following etc. to sell their products. SMBs need to manage their presence on website/s and multiple social as well as e-commerce platforms and need a third-party tool to manage them from a single interface. While Shopify exists, it has an upfront cost and is too complex for a small business owner to use. I believe there is an opportunity to build tools to manage catalogs, payments, delivery, inventory, marketing, etc. on top of these social platforms. This is a global SaaS opportunity targeted at SMBs with high gross margins. Shopify has built a $10 billion market cap company by providing website-building tools and is now rolling out aids to sell on social media. The counterpart in China would be Koudai Gouwu which has raised $350 million from Tencent in their last round of funding to enable shopping on WeChat. However, will big brands use such tools? Maybe, Maybe not! Is there a business opportunity outside brands? We believe yes. A World Bank study suggests that there are 400 million SMBs in emerging markets which presents an immense potential for such a tool. Addressing the biggest threat here, the most popular social tools in India – Facebook, Instagram, and WhatsApp – are all owned by the same company. Facebook’s focus on e-commerce (as is evident by FB Store, Instagram Shoppable Tags, WhatsApp Business API) might leave less value for such online tools. The Go-to-market (GTM) is another big challenge in India. The math of cost of acquisition/ support at scale viz a viz what you can earn makes it hard to build a business focussed on SMBs tools. There are multiple avenues where transactions take place between consumers. Such transactions often require a layer of trust, transparency, and convenience for a seamless experience. These transactions could be in any of the categories, for example, real estate, used goods, rentals, classifieds, etc. For some of these categories, a new age platform that marries social buying behavior with online convenience could be valuable. Tinder, Uber, and Airbnb have built billion dollar businesses leveraging consumer to consumer interactions/transactions and startups like ThredUp, Carousel, Mercari etc. have targeted a broader user base of product commerce/rentals and are getting a good user traction. 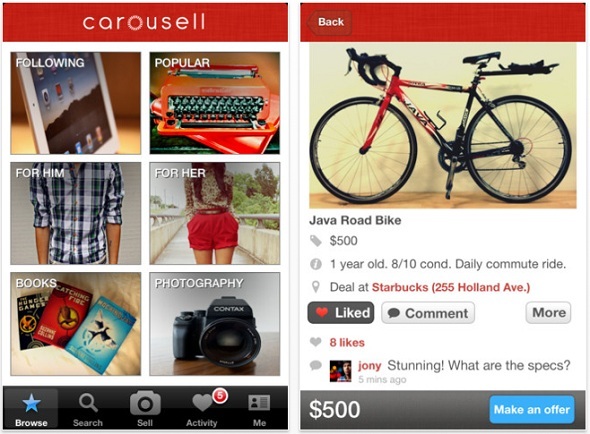 I believe that ventures similar to ThredUp, Carousel, Mercari etc. will drive the C2C revolution in India where social elements will play a significant part in driving engagement and building trust. The sector, however, comes with its fair share of challenges. In C2C platforms, both, demand and supply are distributed geographically, hence, quality checks, experience, and service levels need to be managed (and managed better than an Olx or Facebook). Also, a lot of these startups like Mercari, Carousell, ThredUp, etc. need scale before monetization starts kicking in which requires time, patience and investor support. From Sachin Tendulkar’s “Boost is the secret of my energy” to Virat Kohli’s Manyawar, the list of celebrity-endorsed brands is endless. Then, there are companies like Tupperware which have achieved immense scale with their home sales channel. We believe that there is a huge untapped potential in replicating this offline social purchase pattern in an online platform with celebrities, influencers & salespeople. Influencers help in reducing the marketing costs by bringing their skills and network to the e-commerce platforms. The social network thus created, drives engagement and retention. In India, we have examples of OTAs leveraging the influencer channels to sell tour and travel packages. We believe that coupling online channels with offline ones would work in categories which require touch & feel and/or suggestions. Based on our bottoms up the calculation, there are approximately 2.3 million women resellers in India. Over time, with increasing access to consumers on various social networks, we believe that the number of resellers including students, small traders, fashion and travel bloggers will shoot up as more and more people will start selling on social networks. In China, Yizhibo has been able to build a live streaming app in presence of WeChat, Nutrilite promoted its products and healthy lifestyle by launching a live stream entitled “Breakfast for everybody” attracting 150 million users in 3 days. Similarly, Haier started a live stream to promote its new washing machines which attracted 1.8 million views and 0.12 million followers in just 2 hours. Also, Taobao has been able to build a vibrant community of influencers on its platform. According to an estimate, 7 out of the top 10 women’s clothing stores on Taobao were operated by influencers. It has been hard to sell high touch point items like interior decoration, marriage planning, beauty services, etc. through online channels primarily because the offerings are not standardized. We believe that there is a large scope to create content and community layers which could promote discoverability and transparency, thus, leading to the purchase decisions for such items/ services online. Today, the only resort to booking high touch point items are classified listings across Google, Justdial, Facebook, Craigslist, Olx, etc. The absence of reviews, poor ratings, poor customer satisfaction and poor follow-ups plague these websites which present a ripe disruption opportunity. 1. How to monetize the user in the first transaction? 2. How to build a brand to reduce acquisition costs over time?